This plant saucer is simple and modern and provides a stable base for your beautiful plants and flowers on unstable surfaces and ensures your favorite potted plants and flowers have optimal drainage. Excellent drain tray for DIY gardening projects and decorates around the base of you houseplants, pots or planters. Made of high quality plastic material, corrosion-resistant, non-toxic, durable, Eco-friendly, useful. Lightweight and strong for multiple uses with any indoor or outdoor planter. Round plant saucers collect excess water drainage and soil spillage preventing moisture stains on floors, carpets, and decks. Perfect for plastic, clay and ceramic pots to protect surfaces and to retain water underneath the pot for added humidity. 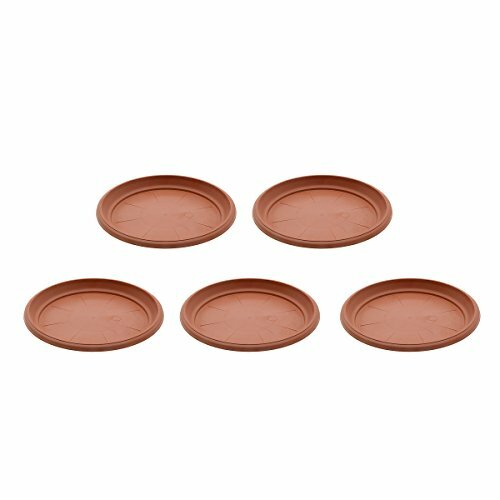 Approximate Dimensions (each pot, in inches): 0.7" H x 8.9" Diameter; Package content: 5 x plant saucers. If you have any questions about this product by Saim, contact us by completing and submitting the form below. If you are looking for a specif part number, please include it with your message.